The Volvo Ocean Race 2014-15 has seen media and mobile age take center stage, as more people get their news and information via social networks and mobile-friendly smartphones and tablets. With increased platforms for media output, we caught up with Volvo Ocean Race Marketing & Communications Director Björn Alberts. We discussed the latest media innovations in the 12th edition of the Volvo Ocean Race and how they’ve impacted and benefitted this year’s race, which features the redefined role of the Onboard Reporter (OBR). Björn Alberts: We re-wrote the job description after the end of the last race. In 2008-09 and 2011-12, the position was called the Media Crew Member (MCM). We basically took a sailor and trained them on different media outputs, like video, photography, writing and interviews skills. For 2014-15 we were determined to tap into a pool of journalists or already-trained media who would be able to sail around the world. We had 2,500 applicants and narrowed that down into a pool of about 100. From there, we put them into buckets with varying skills, languages, etc. In the end, one of the biggest criteria is being able to handle the extreme conditions over nine months on an ocean racing boat. WC: What are the key skill sets for the OBRs, since they are very much the eyes and ears of the race during the offshore legs? BA: The environment onboard an ocean racing yacht is like nothing you can imagine. Not only are you moving forward at about 25 miles per hour, you are going up and down, side-to-side. Those are incredibly tough conditions in which to perform your media duties. Just keeping your balance and your equipment dry is a major feat. Surviving the environment on board as a media professional is one of the biggest “skills” separating OBRs from others. Often times they come previously as adventure journalists. We’ve also come across several media who were very serious sailors – that’s made for a special reporter. Lastly, you need to have a thick skin. Working alongside the same group of sailors for three weeks at a time on a 65-foot boat is not the easiest task when you can only cook, clean and report as part of the team. WC: What are some of the key technologies and equipment that were integrated into the new Volvo Ocean 65 to help with media output? BA: The key technologies can be divided into four groups: 1) video cameras located all over the boat, both fixed and hand-held; 2) audio/microphones picking up the natural audio, as well as recorded interviews and natural sound of the sailors talking; 3) editing and directing equipment in the media station below deck, allowing the OBR to cut edited packages while also acting as directors during livestreaming; 4) the Inmarsat satellite communications that allows all of this terrific media to be sent back to race HQ for distribution to the public and media. WC: What kind of media comes through Race HQ every day when the boats are offshore? BA: Each OBR has a daily deliverables document, which provides a minimum amount of video, photography, text and audio he/she has to send back each day along with social media. Their days are pretty much structured around these deliverables, which have a set time when they need to be transmitted. On top of that, teams make specific requests of their OBRs and media can also put in requests through race control for interviews, live video calls and other material. All of this adds up to quite a busy day. For example, as the boats rounded Cape Horn, we had all sorts of live TV interviews to coordinate: CNN, SkySports (UK), WGN Chicago and SportTV Brazil, to name a few. That was a full day just by itself. The OBRs are allowed by rule to cook and clean, so that becomes part of their duties as well, in order to help the team. It’s really a full list of responsibilities, which is why we often call it the toughest job in sports media. WC: How does media actually gets from the boats to the Race HQ for distribution? BA: The best way to describe the Inmarsat Satellite network is that it is like your cell phone line. Cobham, which makes the satellite hardware and domes that you see on the boat, would be like your iPhone, and Inmarsat would be like your Verizon or Sprint network. Inmarsat makes the communications from the boat to our race headquarters possible through its incredible network of satellites. There has to be a direct line from the domes on the back of the boats to the satellite in order to send and receive information. It’s about as simple as that. The transmission speeds and the amount of data that we can send from boat to our Race HQ in Spain has increased with every race, so we’ve been able to transfer record amounts of data in this race and livestream more than we have ever seen. WC: How much live video and livestreaming has been done this race? BA: As you may have seen during the course of this race, we’ve stepped up our live online production, especially with “Life at the Extreme TV” on the mobile app. We’ve had livestreaming of our arrivals which we didn’t have in 2011-12, except at the Galway finish. Fans have really enjoyed tuning in to see the leg finishes and we’ll have that again in Newport for those that can’t make it in person. They should download the app and watch the arrivals into Newport. We went live to the boats as they rounded Cape Horn on our platform and also did numerous live TV interviews, as I mentioned. The biggest thing we can do for media is do a live TV interview or send footage back for broadcasters to air. We’ve done hundreds of those across the world since the race start. And remember, all this footage made available to TV news broadcasters and our online platform is also edited and produced into our weekly show, Life at the Extreme, that airs globally in more than 100 countries including NBC Sports Network and Outside TV here in the U.S. every week. WC: We’ve reported before about how the Volvo Ocean 65 was designed with media in mind. Has that worked out as planned? 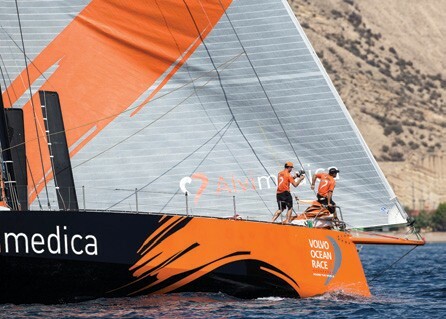 BA: We really haven’t seen any issues, since the media equipment was all done in harmony with the boat design when the Volvo Ocean 65 was designed from the ground up at the end of the 2011-12 race. It’s allowed us to generate the best content we have ever seen in the history of the Volvo Ocean Race. Our Instagram account, @volvooceanrace has grown tenfold since the race start. Our daily videos are watched by more viewers than ever, and our weekly show is more compelling with all the onboard technology we have provided to the OBRs. Our Twitter following is one of the biggest in all of sailing. There will always be a balance between the racing and the media component and it’s up to the OBRs and the race to manage this balance, but in terms of what is capable onboard, anything can be done with the technology on the Volvo Ocean 65. WC: Please tell us a little about your social media strategy. BA: One of our key targets for the race is not just to grow our fanbase, but to build an engaged audience which keeps returning for its regular fix of news and other content. There’s no better way of doing this than through digital and social media. We see our strategy in a giant funnel shape – at the top, we’re trying to make new, uninitiated audiences aware of the race through our own website and other digital media outlets. This can be through websites, but we’re reaching out more and more to relevant bloggers to spread the word in this way. Then we have the main pillars of our social media strategy – Facebook, Twitter, YouTube and Instagram. We now have more than 1.2 million Facebook fans, but that large number does not reflect success in itself. We’re focusing on engagement, exciting our audience with carefully selected cross-media material which they want to consume themselves, share with their friends, and talk about. YouTube remains the number one vehicle in the world to showcase our fantastic videos, and Instagram plays a similar role with still images. More than any, Twitter offers us the opportunity to engage in two-way communication with our fans, to spark debate and break news.